On July 13, 2013, Chris Heston was designated for assignment by the San Francisco Giants to make room for the recently signed Jeff Francoeur. He was released by the team eight days later. At that point, the pitcher was throwing in the mid-80s and posting mediocre strikeout numbers, not to mention the righty was suffering from elbow problems. It was undoubtedly the low point of his career. Now less than two years later, Heston already has a no-hitter under his belt, firing an 11-strikeout no-no at Citi Field on Tuesday in just his 13th big league start. He was masterful, not only striking out Mets hitters, but also keeping the ball on the ground (87 percent of the balls in play were ground balls). With the win, Heston placed his name next to some of the greats in Giants history while also improving his argument for remaining in the rotation when it’s back to full health. Two years after the low point of his career, he’s quite possibly at the high point right now. So what changed? His body. At least that’s what the pitcher said earlier this season when I asked him about his newfound stuff. Scouts never loved Heston. He peaked as the Giants’ 17th-best prospect, and he never made a Baseball America top 100 list. Even more positive reports, like this one from John Sickels at Minor League Ball in 2012, mention his mid-to-upper 80s velocity as a hindrance despite his good results. In 2013, that velocity faded over the course of the season, and the pitcher didn’t feel quite right. “I had elbow surgery that year, and it was kind of nagging me most of the year, and that had a lot to do with why my command and my velocity were down that year,” Heston told me. Last season, Heston returned to the same level of production and velocity he had found before. His walk rate, which had surged in 2013, returned to its normal strong level, and he posted a solid 3.38 ERA and 1.17 WHIP in Triple-A. But he still didn’t get much of a look, no doubt in part because of his mediocre strikeout rate (6.5 K’s per 9). Whatever he did, it worked. His velocity is up slightly this year, and his pitches are moving like never before, especially his primary pitch, a sinker. In the graph below, his numbers have been indexed to league average to get a sense of what the added gas and movement look like in league context. 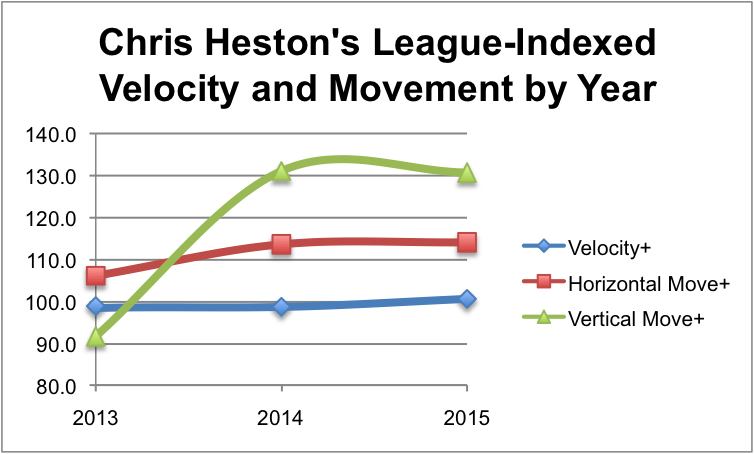 By velocity, Heston went from below league average to above average in the last three years. As you can see, he went from slightly below-average velocity to slightly above, and that his sinker gained extra movement as well. So what can explain the jump in movement? According to Heston, it’s all about being healthy and getting his mechanics right. Things weren’t right before he had midseason elbow surgery in 2013, but the strength and mechanics slowly came back. “I got more extension, velocity and command,” said Heston. The velocity boost seems to come more from the added weight. He was drafted at 185 pounds, put on 15 pounds between draft day and 2014, and then doubled that addition this past offseason. “The extra tick or two is definitely helping me out,” Heston said, and the research backs him: Every mph on the gun is worth about seven-tenths of a run prevented over the course of nine innings, Mike Fast found before the Houston Astros hired him away from writing. 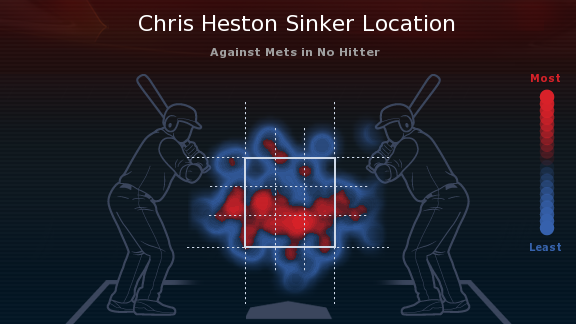 And velocity was a big factor in Heston’s no-hitter. He hit 92 mph or better on the radar gun five times; prior to Tuesday’s start, he had hit that mark just twice, according to the PITCHf/x database. And his max velocity is up a full run this year compared with last year. That’s being aggressive down in the zone! The added movement Heston has gained the last few years wasn’t limited to his sinker. His slider has added an inch and a half of horizontal movement and two and a half inches of drop, for example. Heston hast to make sure to separate that slider from his curve, which averages a similar velocity (75-77 mph). “Sometimes they’ll kind of run into the same velocities,” Heston admitted, “but they definitely are two different breaking balls, one’s more horizontal, and one’s more vertical.” The curve still has six inches more drop than his slider, and Michael Cuddyer gave both pitches some love after the no-hitter. And the weight itself will have more benefits than just velocity and movement. Stamina is huge, too. Brandon McCarthy recently noted, players lose weight over the course of a season due to the schedule they see on the road. Heston agreed: “I think everyone’s going to lose a little bit of weight over the course of the season. They feed you like crazy, but still, compared to the offseason, you do a lot of sitting around.” He hopes the added muscle will help. “I wanted to put on that weight so that when I came to this season and started to lose it again, I’d be in a better position,” he said. Anytime a pitcher throws a no-hitter, there’s a decent amount of luck that comes into play. But it can also represent the culmination of years of hard work and adjustments, as is the case with Heston. He got healthy, he got bigger, he learned to pitch to contact, he learned where in the zone he’s most effective, and voila, we saw this week what could come from that. “I think it all comes to together: extra velocity, extra movement, and the pitches are sharper,” Heston said earlier this season. And that’s exactly what happened Tuesday night. We hoped you liked reading Chris Heston, now with more Chris Heston by Eno Sarris! Nice piece (and title!) Eno.